Submitted by Bill Schmoker on 8 August 2010. If the Healy averages a speed of 12 kts, then it will go 288 nautical miles in a day. 288 / 11,000 = .026 nautical miles per gallon. Taking the inverse of that, we see that the Healy consumes around 38 gallons per nautical mile. Yesterday I got to help out with an XBT cast. 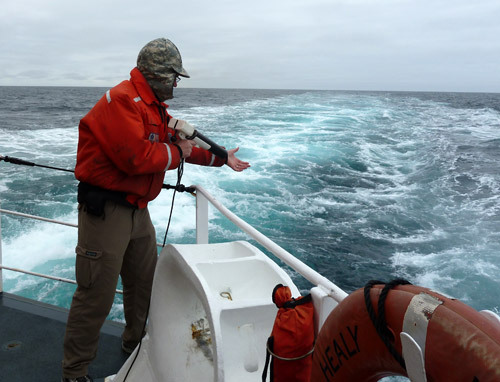 This was my first chance to see an instrument put overboard to collect data (up until then I had just seen data coming in via the computer systems.) XBT stands for eXpendable BathyThermograph. The expendable part means that it is dropped into the water but not recovered- it sinks to the bottom and is left there. Bathy is a prefix for depth, and thermograph means it records temperature. So the XBT is used to determine the temperature profile of the water column, recording temperature vs. depth as it drops through the water column. XBT Cast / Bill sending an XBT over the aft rail to record temperature vs. depth through the water column. One hand is used to guide the thin wire that returns data to the ship from the probe- we don't want it getting snarled on the rail. Also note the lack of ice- we were near the Mackenzie River which warms that part of the Beaufort Sea. 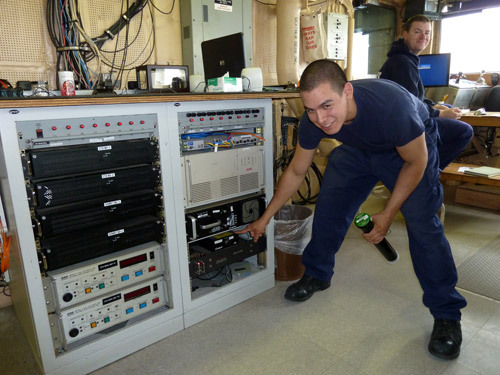 Marine Science Technician Marshal Chaidez gave me a tutorial on what we were going to do and how the XBT works. Basically it consists of a lead weight, a sensitive electronic thermometer, and a lot of very thin insulated copper wire that are all housed in a plastic launching tube. There are actually two hair-thin wires in the line in order to compete the circuit from the probe to the ship's computer. 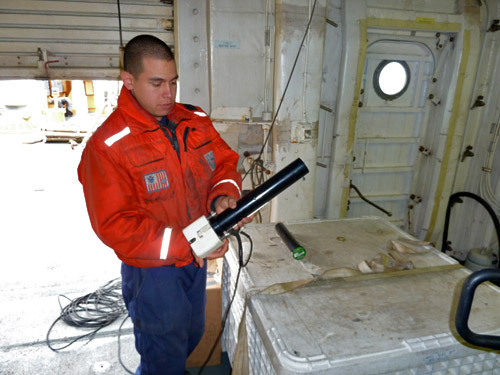 The tube is loaded into the launcher, which looks kind of like a caulking gun. The XBT has leads that connect it to a cable running out of the launcher to send the data to a shipboard computer. When it's time to go, a pin gets pulled and then you tip the XBT over the stern rail. It descends at a known rate though the water, trailing the very thin wires. 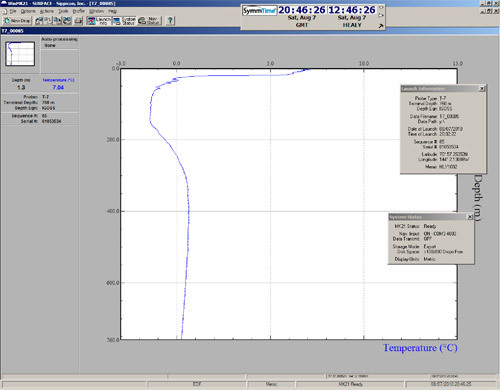 Temperature data is sent up though the wires and depth is determined by timing the descent. The XBT we used recorded temperature down to 760 meters deep. MST Marshal Chaidez explaining the XBT system / MST Marshal Chaidez explaining the XBT instrument and computer system that records the data sent back from the water column. Preparing the XBT / The XPD looks like a black PVC pipe. It is place into the launcher, which looks like a caulking gun and is connected via a cable to a computer which records the data. A pin holds the XBT in place until it is time to send it overboard. This data is important for keeping the sonar systems properly calibrated, because water's density, and therefore the speed of sound through water, changes at different temperatures. Colder water is more dense (and sound travels faster through it) and warmer water is less dense (with resulting slower sound speeds.) Since sonar relies on the timing of sound pulses sent down and reflected back, the senior scientists need that information to get the most accurate bathymetry data from the sonar systems. The scales are a little hard to read on the XBT graph but temperature is on the x-axis (top.) -3°C is at the left and then 0°C, 5°C, 10° C, and 15°C going right. Depth is on the y-axis (left side) with 0 Meters at the top followed by 200m, 400m, 600m,. and 760m at the bottom. Our surface water temperature was about 7° C, quite warm considering we'd come through a lot of ice to get there. This is because we were approaching the Mackenzie River, which carries lots of relatively warm water out into the southern Beaufort Sea. The water temperature quickly dropped going down, getting below 0° C at about 20 meters deep. It warmed a little at around 250 meters deep (to a balmy 0.7°C or so) and stayed pretty constantly just above 0°C down to the cut-off depth of 760 meters. Temperature Profile from XBT cast / This is the graph produced by the XBT, showing temperature vs. depth. You can see a distinct surface layer that is around 7° C with an abrupt drop in temperature below 20 meters. The XBT graph shows water below 0° C starting about 20 meters deep. It gets as cold as about -1.5°C from around 50-150 meters deep. How can this be liquid water at temperatures below 0°C? The relatively warm surface temperature was due to the nearby Mackenzie River delta. In addition to warming the sea surface temperature, can you think of another effect that the river would have on sea water near the surface? Weather Summary: Patches of fog, mostly icy sea with some open leads.